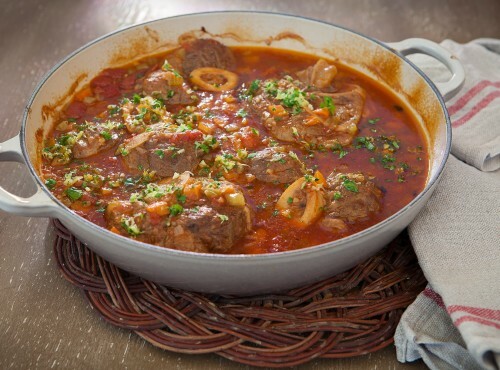 Ideally, osso buco is made with slices of veal shin from the hindleg, which is meatier than the foreleg. This recipe could also be made with forequarter chops, but the cooking time will probably be a little less. If the only veal available is from bobby veal, the pieces will be quite small and the cooking time will be considerably less. In an enamelled cast-iron casserole that has a lid, heat butter and oil until foaming. Tip in onion, carrot and celery and cook for 5 minutes, stirring from time to time, until vegetables are well softened. Transfer vegetables to a sieve set over a bowl and press well to retrieve as much of the buttery juice as possible. Discard vegetables. Roll veal in seasoned flour. Return buttery juices to casserole and add veal, with the side that has the most marrow visible uppermost. Pour on wine and allow to bubble up quite strongly. Add tomato, garlic and enough stock to barely cover meat. Put baking paper, cut to fit, on top of liquid to protect meat and delay evaporation. Cover casserole and simmer for 45 minutes on top of stove (or in an oven set at 160°C). Check that meat is still just covered with sauce – if not, add a little more stock or water and replace baking paper. Cook for another 30–45 minutes – by this time the sauce should have reduced and become thick and the meat should be quite tender. If the meat is not ready, cook for a further 15–30 minutes. To reduce the sauce if it is too liquid, remove lid and increase heat for 5–10 minutes. To serve, transfer meat very carefully to a hot serving dish or individual plates and scatter with gremolata. Variation Substitute slices of venison from the hindleg for the veal. The meat may take an extra 45 minutes to become tender.